Salmon roe is considered one of the most healthy and nutritious fish products. So what is salmon roe? This exquisite product is obtained from salmon species including pink, chum, chinook, sockeye, coho salmon, trout, and salmon itself. Now it seems unbelievable, but until recently red caviar was not regarded as a delicacy. On the one hand, people simply did not know how to prepare it for long-term storage; on the other hand, it was not that necessary. 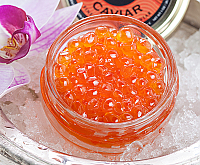 Nowadays, red salmon caviar is an internationally recognized delicacy. It has pleasant mild flavor, it is nutritious and useful. 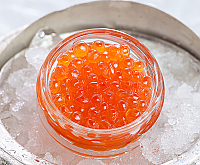 In addition, red caviar price is much cheaper than black Sturgeon eggs, that is why many can afford to buy it, especially when to find salmon roe for sale! American Salmon Roe Caviar 'Malossol'. Mild but saltier flavor. Мedium to large size beads of red-orange color. 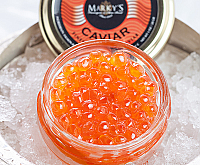 Marky's Salmon Roe Keta Caviar - Chum Salmon - red caviar, ikura. Extra large firm eggs of golden-orange color with strong sweet and honey-like taste. 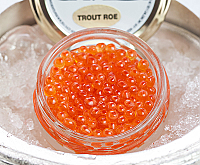 Fresh Pink Trout Roe Caviar - comes from freshwater trout caught in smaller inland lakes of France. These firm, translucent pink berries of medium size with a remarkable tiny orange eye in the center have an assertive bold flavor. Fresh Salmon Roe Caviar 'Malossol' from Canada. Translucent and large attractive grains of red-orange color with fresh sea-breeze and not too oily flavor. These products are perishable and will be shipped by Overnight Shipping. To most U.S. states - $30.00 (1 business day). If you place the order now (before 2:00 PM EST), the closest possible date to receive your order is tomorrow, Sat, April 20th, 2019. Choose "I want a specific delivery date" on checkout to get a Saturday delivery (extra charge is $15.00). Free shipping will be applied for orders starting from $350.00 (exceptions apply). What kind of red caviar is better? 5-7 mm in diameter – chum or chinook salmon roe. sockeye salmon roe – bright red color. sockeye eggs are small, have a dark red color, strong pleasant smell and slightly bitter taste. To say the truth, it is a moot point what kind is the best as everyone has different tastes, but most believe that the tastiest eggs come from pink and chum salmon (their pearls have a pleasant taste and orange shining color. Caviar of other fish species has a red color, and their bitterness level is higher. The delicacy possesses healing and beneficial properties – is a very valuable food. The composition comprises vitamins A, E, D, proteins, fatty acids, folic acid, phosphorus, iodine, and calcium. The product’s protein content is 32%, which by the way, digests much faster and better than the proteins of meat and dairy products. Healing properties of red caviar are widely used to improve the functioning of body systems, for rejuvenation, and to accelerate tissue regeneration. This is a good protection against various diseases. In addition, the delicacy is good to use for restoring strength and energy after nervous tension states and surgery. The eggs proteins give energy and strength, as well as activate the metabolism at the cellular level. Regular use of this product helps to normalize pressure. Caviar is also a preventive measure against the development of tumors. Polyunsaturated fatty acids contribute to the rapid excretion of harmful fats, reduce cholesterol levels in the blood. Red roe is effective in the treatment and prevention of atherosclerosis and other diseases of the heart and blood vessels. However, the beneficial properties of caviar act only when its use is moderate. The content of vitamin A improves vision, brain function, normalizes the nervous system; vitamin D strengthens the skeletal system; vitamin E improves the condition of hair, skin, and reproductive organs. Iodine normalizes the thyroid gland function. Zinc promotes healthy hair growth. Iron increases the level of hemoglobin in the blood. Magnesium relieves muscle tension and is necessary for the treatment of convulsions. Where to buy salmon roe. If you are wondering where to purchase this nutritious food item, you are in the right place. 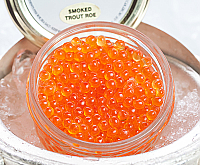 Our online shop presents to your attention the best salmon caviar price, as well as often offers salmon eggs for sale. Remember that it is quite dangerous to buy this pretty expensive product at stores that are not specialized in it. You should also avoid buying caviar privately as there is no guarantee that this is original roe, which has been tested for quality, transported and stored under strict temperature-controlled conditions (for caviar – from -4 ° C to -6 ° C). Ikura is a Japanese equivalent to salmon roe that is widely used in other languages. Ikura salmon roe is often served in Japanese cuisine either by itself or as part of another dish (as an example, various types of sushi). Actually, it does not matter whether you call this excellent delicacy “ikura” or “ikra” (Russian caviar term), it is still an amazing product with unbelievable taste, granules of which simply melt in your mouth. What else in this world is necessary for happiness?